After disappointing defeats, last night’s U21 victory was a boost for Limerick. Limerick's Colin Ryan celebrates last night's victory with supporters. AFTER A SERIES of hurling setbacks, Limerick’s fans finally found reason to cheer last night. The county’s senior, intermediate and minor teams all suffered championship defeats over the past week but the U21 side stepped up last night to ease the level of disappointment. In front of their home fans at the Gaelic Grounds, they delivered a two-point win in their Bord Gáis Energy Munster semi-final clash against Tipperary. “We had a bad week, we had a rough week,” admitted Limerick U21 boss John Kiely. “Each team is in their own space at the same time so you acknowledge it, but you don’t allow it to affect you. “This win is huge for the fans and please God they will come out in their droves in two weeks time down in Ennis. “I am out of breath after that. It was a titanic battle. We’d a great first 20 minutes, we really took the game to them. “We knew if we were to have any chance tonight, we were going to have to make a stand in the first 15 or 20 minutes. “They’re a fantastic side, this Tipperary team. They won an All-Ireland final at this level three years ago at minor and we knew it was going to take a huge effort to turn them over. Kiely hailed the impact of Limerick’s substitutes in the closing stages. “All our subs came in and made an impact, they chipped in with points, they worked hard. Colin Ryan in particular (was) fantastic. “It was a tough call on him not starting but he’s just out of minor, we said we’d hold him for the last 15 or 20 minutes. It paid off. Clare are next up as Limerick’s final opponents with Kiely looking forward to the upcoming tussle. “It is a big ask to go down to Ennis for a Munster final to play the three time Al-Ireland champions. Email “'We had a bad week, we had a rough week' - Limerick hurling bounces back”. 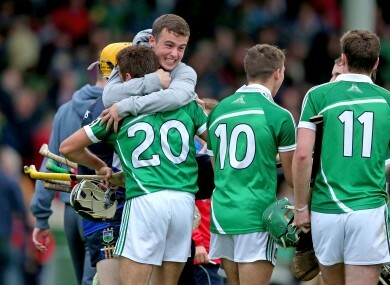 Feedback on “'We had a bad week, we had a rough week' - Limerick hurling bounces back”.